For a website with not one, not two, but three Patricks, we just couldn’t let St. Patrick’s Day go unrecognized. It wouldn’t be right. Today’s the day that everyone can be a Patrick (even George E), have a green beverage or three, and enjoy a fine cigar (maybe even a candela, like the one pictured). It also happens to be the first day of one of our favorite sporting events: the NCAA March Madness tournament. We’ll be back with our regularly scheduled Friday Sampler tomorrow. In the meantime, let us know in the comments how you plan to celebrate this most Patrick of holidays and, if its not too early to divulge your bracket winner, which team you think will be crowned the 2011 March Madness champion. I'll take a Guinnes and a Ashton VSG as my St. Pattys pairing. Ohh, and I'll take Florida to win it all. I'll be having a Smithwick's with a 601 Green Label. UConn is your winner. Guinness (of course) and a PG Symphony. KANSAS. 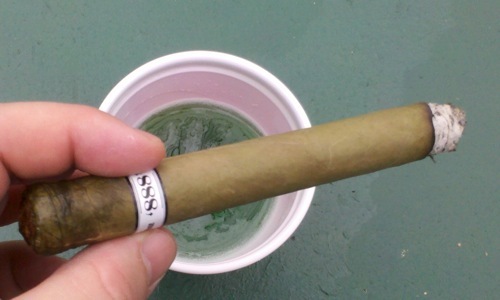 I've got a Illusione HL Candela I've been saving, and I'm pairing it up with a Jameson Gold. St. Johns shocks the world. Good call on the Jameson Gold! St. Patty's doesn't always have to be about beer. The only candela cigars I have are Camacho Corojos, which I love. I may grab one of my dwindling stock of those for tonight's cigar. As a Patrick, I've got to have both Guinness and Jameson at some point today. Haven't decided on a cigar yet…that will be a gametime decision. I won't share my bracket winner yet, but — as an alum of both schools — I'm taking Illinois and George Mason to win in the first round. I've got an ~88~ Candela and a WLP Candela lined up for this evening during the Michigan State game. GO GREEN! Go White! I'll pass on the Candela, but maybe I'll pick up a Puros Indios (the band is green). As for a drink, I'm thinking Michael Collins Single Malt Irish Whiskey. Smoking an isom cohiba on porch with sweet sounds of the Clancy brothers, dubliners, and the pogues. Great Lakes pale ale in the glass. Cheers all! Todd is clearly the only one with any sense here. Go Gators!! If I grab a cigar it'll be my last 88 candela and I'll be drinking a Harp. Celebrating with a rocky sungrown and some paddy's whiskey on the rocks.